I have wild wineberries in my yard. They are BEAUTIFUL! I picked a bunch the other day and decided to make sorbet. 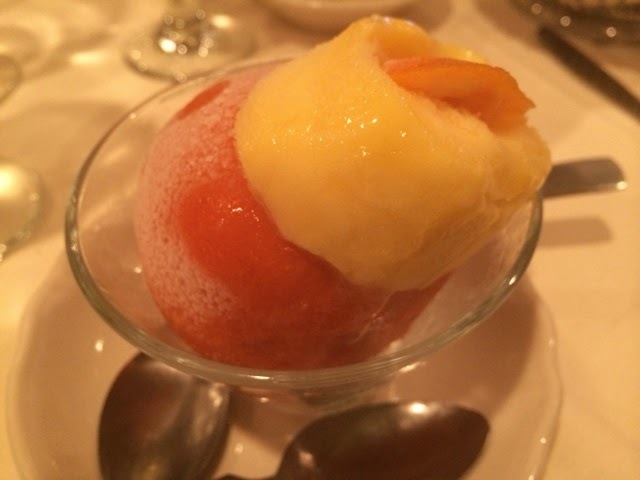 and processed the entire mess through the sorbet maker. I wasn't thrilled with the consistency. It's kind of icy. Stir, and enjoy a fresh wineberry soda. So what will I do with the rest of the berries in my yard? I dug into my pile of strings to make this. I have no idea what I'll do with it, but it was fun! The Quilt Basket in Pawling, NY is introducing "Cutie" packs of fabric. 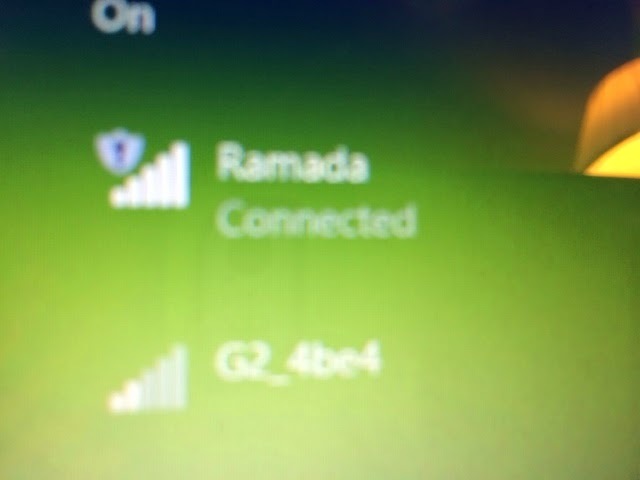 This one is following me home. 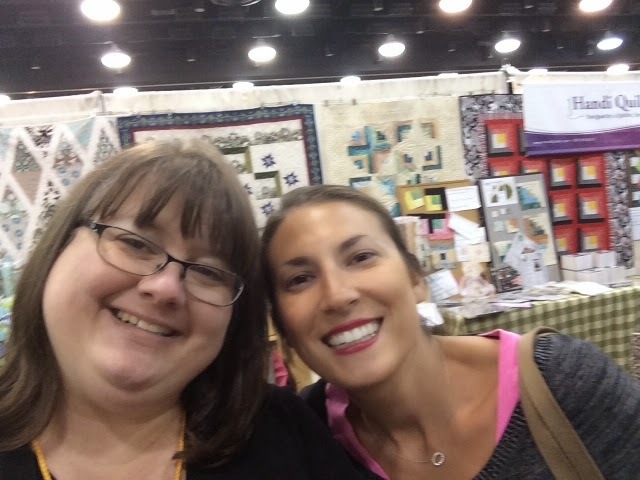 I had fun seeing friends at Quilt Odyssey today! 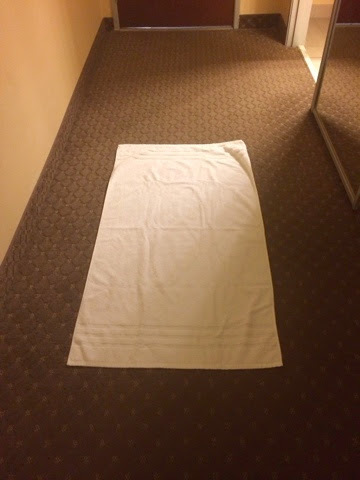 I had fun using a hotel towel instead of a yoga mat. The friendly folks at The Quilt Basket drove me to this show so I packed lighter than usual and left my mat at home. The Quilt Basket has the entire line of American Made Brand fabrics. 50 solids for 50 states. The cotton is grown in the US, the fabric is made in the US, and it's $6 a yard. What's not to love??? When I couldn't decide how many yards of a particular color to get, I will confess to buying the bolt. Once I make the quilts, I will quilt the quilts on my American-made quilting machine -- Handi Quilter!!! 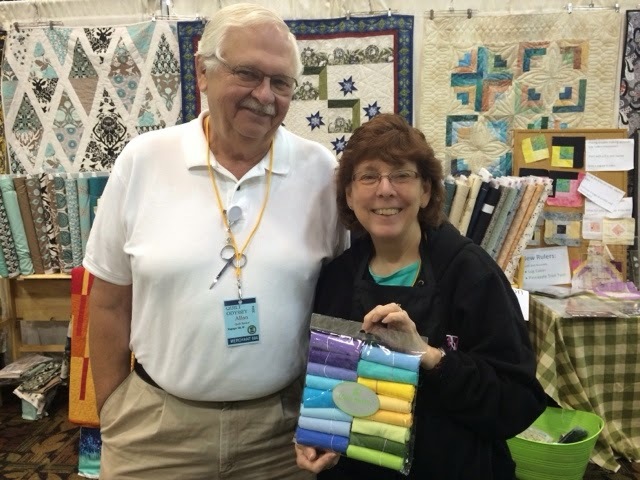 I spent my day at Quilt Odyssey in Hershey, PA working in the Quilt Basket booth. 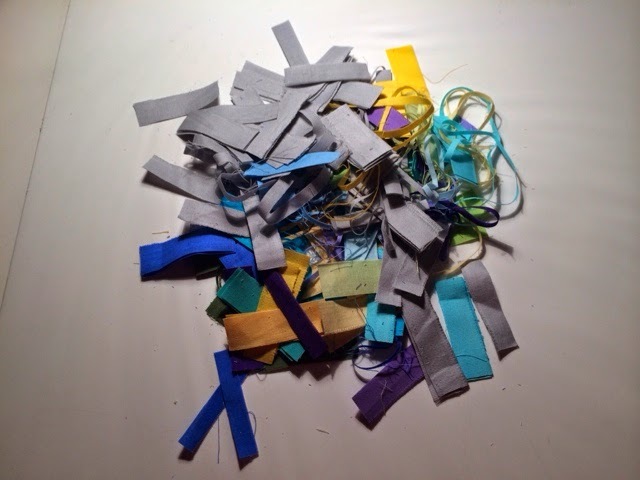 I cut fabric and spread Handi Quilter love. Doesn't that sound like the recipe for a perfect day? Her: "Can I get you anything else?" 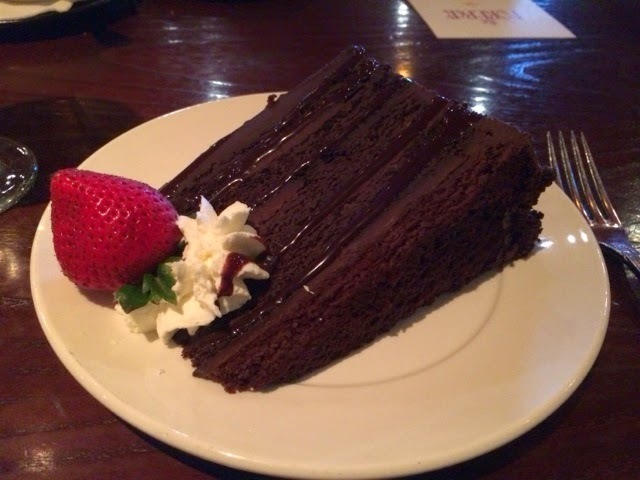 We were speechless, staring at these huge desserts. My oh my was it delicious! I am back at the hotel now and it is time to do battle with the bedside lights. It's a nice light, bright enough to bind a quilt. Good thing, too, since I have to bind a quilt and ship off to a magazine on Monday morning. Bright is a good thing, but "on" is really important, too. Have you ever needed instruction to turn on the light? Me neither, but there's a first time for everything. 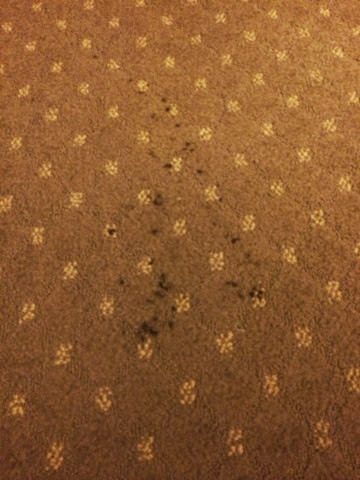 It is no problem at all to turn on the light switch when I get into the hotel room, then cross the living room and get into bed. That works. I could even use the switch on the light to turn the light off. The problem is that the light switch is a timer and shuts the light off every 30 minutes. Am I the only person who sits in bed binding a quilt for longer than 30 minutes? How about reading? So, every 30 minutes throughout the evening, I get out of bed to stumble across the room in the dark and turn the light back on. I would really love to give some helpful hints to whomever thought that this was a good idea. I think that the half-baked cookie was the perfect antidote to the half-baked light switch design. 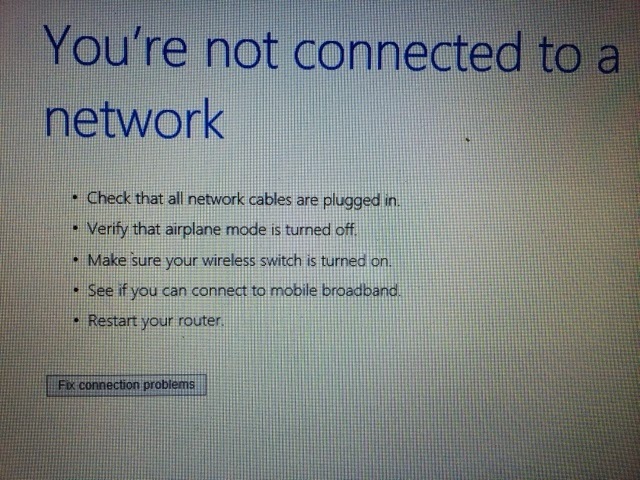 That will make me forget my internet woes. Any 6 or 8 people care to join me in my hotel room? Because I have definitely lived in smaller apartments. 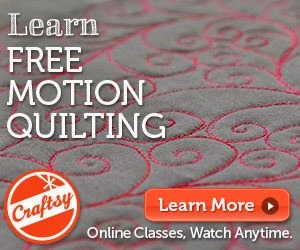 Will I see you at Quilt Odyssey in Hershey, PA tomorrow? I'm at booth 804. Stop by and say "Hi!" I belong to a CSA (Community Supported Agriculture). We get our "share" of the produce on Fridays. and made pesto. Mmmmmmmmmm, pesto! Salad with fresh butter lettuce and fresh carrots, fresh bread with green garlic pesto, and farfalle with oil, garlic, red sauce, and Parmesan. I love this part of summer! One of the fun things I'm doing in 2014 is filming quilting YouTube videos of Pat Sloan's Globetrotting block of the month. Each month, the block is based on a different city. In May, Pat designed a block called "London." 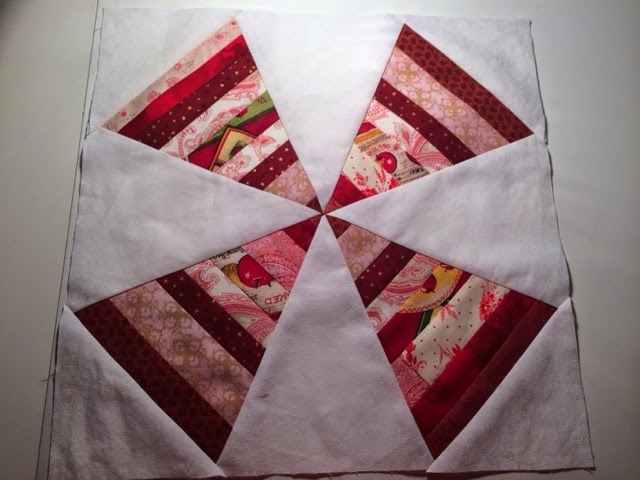 I just taught quilting in Birmingham, England and spent a few vacation days in London when I was done. I though it would be fun to bring my London block with me. Benedict Cumberbatch thought it was lovely! I didn't get a photo of my quilt block crossing the road, though, because I would have died. I am used to traffic on the right side of the road and they drive on the wrong side of the road in England. That's hard enough, but... Abbey Road is CRAZY! It is a crosswalk at a three-way intersection. There is not an official stop light/walk light. Pedestrians must rely on the good graces of the drivers. I managed to cross the road once without getting killed and didn't want to push my luck trying it a second time with a quilt block in hand. I will do a lot for this quilting blog, but playing Human Frogger goes too far! A little cropping goes a long way! 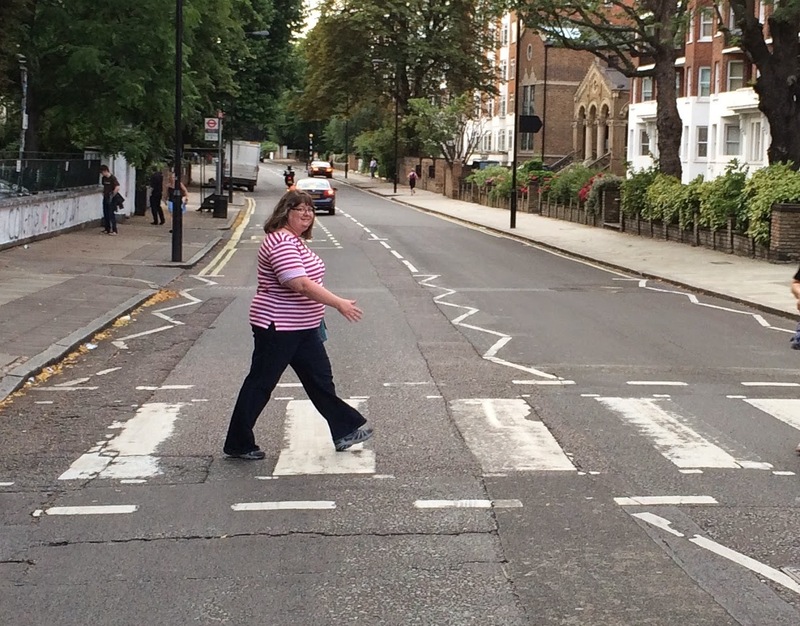 Other than nearly being flattened on Abbey Road, my London Block and I both enjoyed our trip to London very much! Are you making the Globetrotting quilt? Have you been to any of the cities with your blocks? This post is late. Tuesday night the hotel wi-fi in my hotel didn't work. Wednesday night after overseas travel, "I" didn't work and passed out before I could blog. I woke up in London on my last day in the UK. I spent the morning/early afternoon at the British Museum. I could have spent a week there! My husband and I kept making references to "The Shining" movie. We didn't notice any small children riding tricycles in the hotel, so that was a relief. We had a fabulous dinner our last night in Birmingham. Sound quite English, doesn't it? It was delicious. I may have sampled/stolen the Turkish Delight on the top left of his plate. Farewell, UK. I will definitely miss you. I hope to see you again soon!